Although I wrote everything I know about squirrel issues for this website, oftentimes a problem with squirrels in the attic is beyond the scope of the do-it-yourself homeowner to solve. I have found a professional company in Raleigh, North Carolina that handles problems with wildlife. 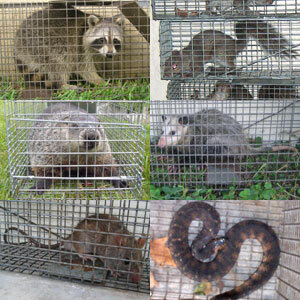 Carolina Wildlife Removal has access to tools, techniques, and experience that help them do a far better job at wildlife removal than a non-experienced homeowner could. They possess licensing that allows them to do certain types of work legally, that non-licensed homeowners in the state of North Carolina are not allowed to do. For the welfare of your situation, and the squirrels, in some cases it's best to hire a pro. There are good companies and bad companies out there. I've done research on such companies, to get to know them, and feel confident recommending their services. I therefore recommend a company called Carolina Wildlife Removal which services Raleigh, North Carolina. If you have a squirrel problem, or any other conflict with a wild animal, and live in Raleigh, I am confident that this company, Carolina Wildlife Removal, is the one to call. I asked the company to describe their service range, and they said this - Our service range includes downtown Raleigh, and the entire Raleigh Durham area, including Hillsborough, Chapel Hill, Morrisville, Cary, Apex, Garner, Knightdale, Wendell, Wake Forest, and more. Carolina Wildlife Removal operates 24/7, so don't hesitate to call at any time to discuss your wildlife problem, and schedule an appointment for same-day or next-day service. Hi David. Unlike most of these people on your blog I want squirrels on my property. I live in the country on one acre and I have nut and fruit trees. It would be a squirrels dream to be here. I have feeders in the trees and housing just waiting for move ins. Unfortunately the only squirrel I saw ran across the street before looking and didn't make it. It may have been a suicide but who really knows for sure. I do not want to purchase the critters and was wondering if you could help me with any information on squirrel relocation. I WANT SQUIRRELS,PLEASE HELP! Thanks. Hello, I recently moved to the middle of North Carolina. Recently I have been hearing tapping/scratching on my ceiling of my dormers(in the bedrooms). At first I thought it was squirrels but quickly ruled that out because the sounds are only heard at midnight or 3-4am. If we hear the noise the animal will stop if we bang in the ceiling BUT we won't hear it move/run away from the location then approximately 20min later we will hear it in a different dormer. The weirdest is the lack of noise it makes when it moves. We have set traps for squirrels and mice but nothing has been tampered with. We also can't find any holes in which they may be entering or exiting. Please help us we are very dumbfounded by this creature!!!! Hi Dave, I have been dealing with a "minor bat issue" but now I am moving onto flying squirrels. They are not in my house but I can hear them in the outside wall returns of my dormers. I am working with true-tech but it seems really slow to resolve. I assume they are using the soffits as a roadway and home. The dormer area bothers me the most. I have considered opening the exterior dormer wall, cleaning out debris and waste then putting a solid wire that eliminates re-entry and maybe insulate with hard foam or spray foam. Does that sound like a beneficial approach. Hi Dave. I have now graduated from a "mild bat issue" to FLYING SQUIRRELS!! The squirrels seem to be residing in the exterior walls to my dormers. I live in a log home without an attic but the squirrels are living in the wall space return on side of the dormer. I have true-tech working on it (they were/are working on the bat issue) but it looks like a long process Now to my main question. I have considered opening up the wall to the dormer externally then cleaning the area especially any waste product then putting up a wire barrier to stop future access and re insulating the wall with hard foam or spray foam Does this sound like it might be effective. True tech can continue to try to locate and close access to the soffits as that seems like it might be a super highway for them. If you have a squirrel problem in Wake County North Carolina, or any other conflict with a wild animal, I am confident that we can solve it. We use humane methods when dealing with Raleigh wildlife removal situations. Squirrel Control Raleigh. Our company is fully licensed and insured in North Carolina. Call us any time at 919-825-2060 for a price quote and to schedule a same-day or next-day appointment to solve your squirrel problem in Raleigh.